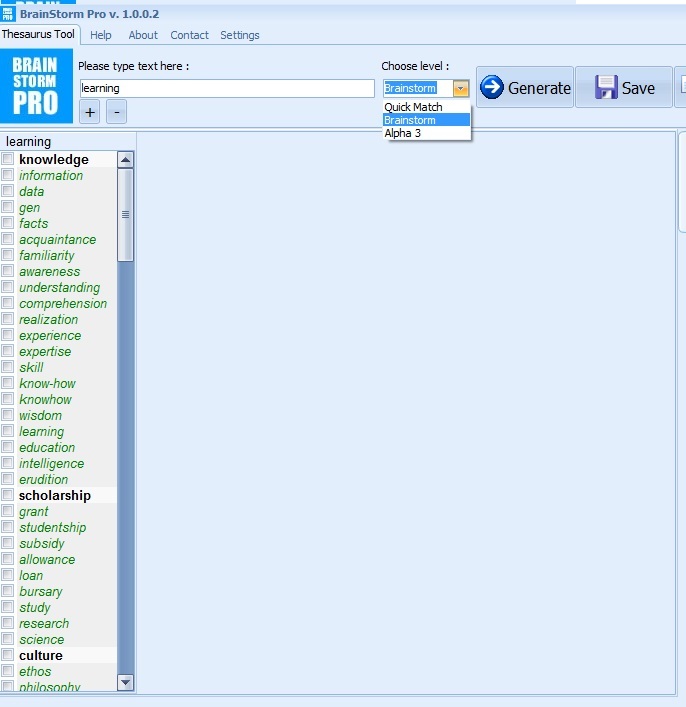 I had the chance recently to check out some new thesaurus software, called Brainstorm Pro. First, a true story real quick. (My friends have already heard this, sorry.) In college, one of my professors circled a repeated word in my paper and wrote in the margin, with red ink, "Use a thesaurus." Folks, I had repeated the word on purpose, and my hackles were raised. Back then LiveJournal was a thing (like Facebook but with lengthier posts) and on it I complained about the incident at length, speculating that my professor saw me as a simpleton who probably thought that a thesaurus was some kind of dinosaur. This post ended up earning me the official nickname "Thesaurus" at Alpha Theta, which is by the way the nerdiest and most awesome coeducational fraternity ever. Anyway, what I'm saying is, I actually love a good thesaurus. I use them constantly while writing Make Your Point; generally at any given moment I have at least one tab opened on thesaurus.com, and in Microsoft Word, I'm a compulsive right-clicker to view synonyms. So, my ears perk up when I hear about any new effort to improve on the basic idea of the thesaurus. Which is where Brainstorm Pro comes in. "More than 20x the synonyms of a regular thesaurus"
"Enhances your natural writing ability"
"An easy way to brainstorm & discover ingenious & creative new ideas"
As you can see, you input multiple words and the software generates a list of synonyms for each. Neato! Well, actually, nothing turned up for the word "learning." I enter "learning" by itself and it works just fine, though, so apparently if you throw punctuation in there, you'll gum up the works. Good to know. There's a dropdown box that lets you switch the mode from "Quick Match" to "Brainstorm," and this is when the search results get really helpful. I can't easily show it to you, because you have to scroll way down to see all the results, but suddenly there's an organized list of synonyms and possibly related words for "learning," organized by categories like "knowledge," "scholarship," and "culture." I'll have to play around with it more to be sure, but for now I ran a quick test. One of my favorite words is "efficient" and I use it way too much. I looked it up on thesaurus.com and got 48 suggestions, some of which branched out into ideas that I might have meant instead, like "masterly" and "virtuous." Next I set the new software to "brainstorm" mode and asked it to also suggest synonyms for "efficient." I got about 80 results then, and much of these branched off into many different directions of meaning--from "powerful" to "cheapo" to "commercial" and "worthwhile." Hmm. Those results are interesting, and potentially helpful, but they didn't send me into a state of word-nerd rapture. My conclusion? Brainstorm Pro is clearly in development at the moment. I'm not convinced right now that the claims I quoted above are supported, but as the program develops, that could certainly change. With a more readable and beautiful appearance, it could win over my word-loving heart. The thing is, any standalone thesaurus software has to be not just a little better but a lot better than existing options if we're going to take the trouble to open it up and use it. 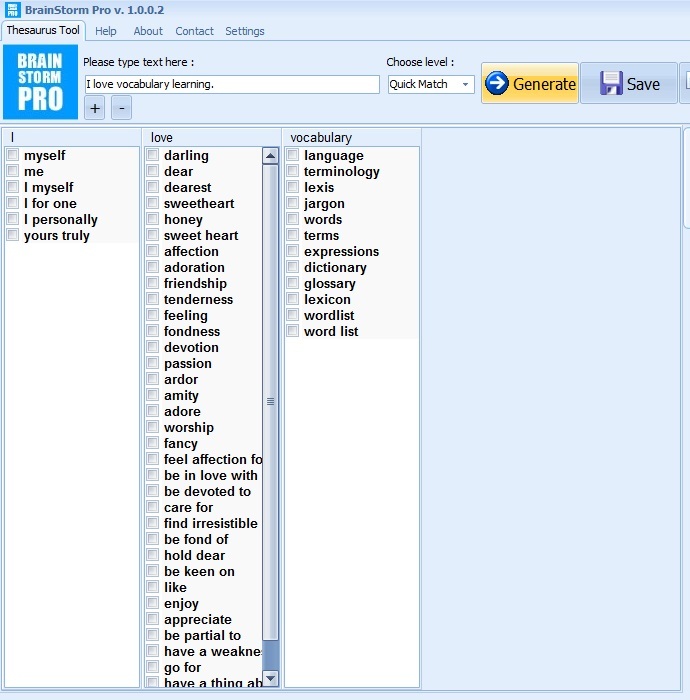 For the time being, I'll probably just rely on Brainstorm Pro whenever I can't get thesaurus.com to work magic for me. Try it out for yourself with the free download here, and let me know if I've given short shrift to any nifty features.